Stupidity it is when an individual takes their precious time to repeat the same wrong things again and again intentionally. A genius sometimes can not answer a simple question asked by a stupid person. Stupidity is like art. Everyone can do it, but only the truly gifted are masters at it. Does anyone know the number to 911? I don't diet. I just don't eat as much as I'd like to. I've never had major knee surgery on any other part of my body. I was in a no-win situation, so I'm glad that I won rather than lost. I want to rush for 1,000 or 1,500 yards, whichever comes first. I do not like this word 'bomb.' It is not a bomb. It is a device that is exploding. 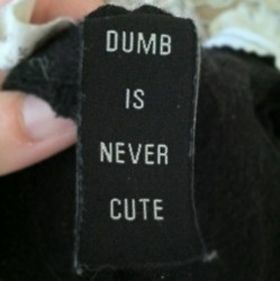 The word “dumb” also indicates stupid people. People who are foolhardy and don’t think much before they speak are called dumb. In the words of Yul Brunner, “Girls have an unfair advantage over men: if they can’t get what they want by being smart, they can get it by being dumb.” Though, being dumb is not good, in any way.